Those of you who follow political history or remember Harold Wilson's Labour Government will know how important a figure Joe Haines was. He was Wilson's Press Secretary and spin doctor (even though the term did not exist in the early 1970s); the forerunner to Bernard Ingham and Alastair Campbell. After Wilson left office Haines joined the Daily Mirror as Political Editor and subsequently Assistant Editor. He was a very significant player and a major figure in the British Labour Movement at the time. 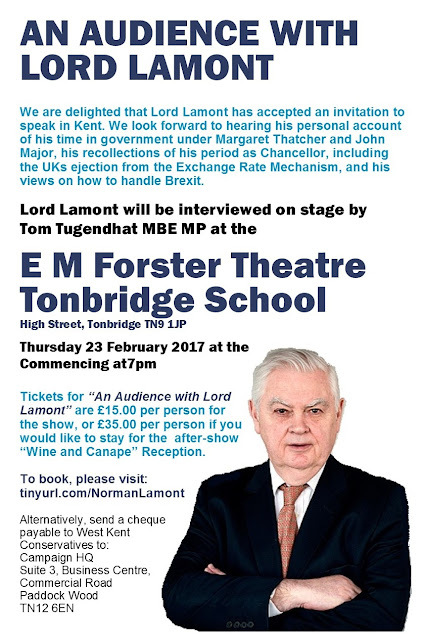 What (to my shame) I did not know - and really ought to have known - is that he not only still lives in my patch, but was actually a Labour councillor in Tonbridge in the early 1970s. In face he was councillor for Trench ward - the same ward in which we fought and won a stunning by-election on 8 December last year with over 60% of the vote. 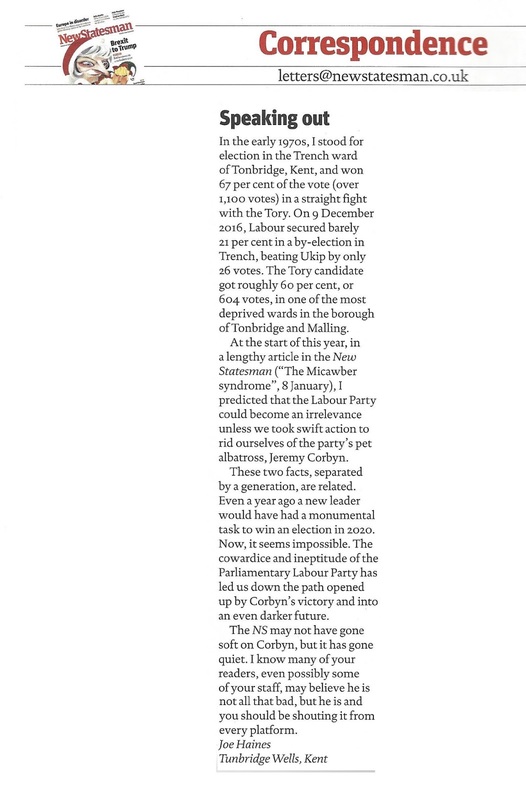 Mr Haines was so appalled at Labour's results in his former ward, and the general prospects for Labour under Corbyn's leadership, he put pen to paper in the new Statesman just before Christmas. Here is his letter. 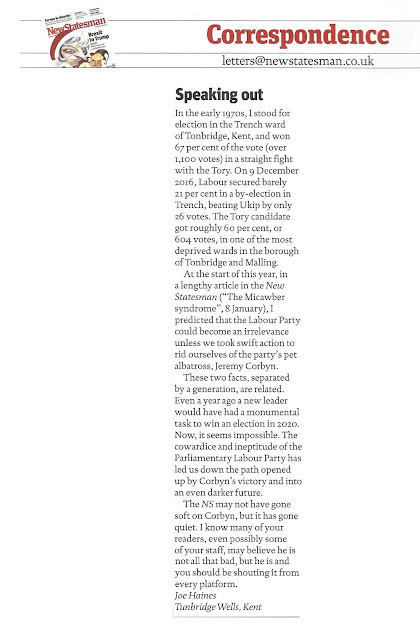 My thanks to my friend and colleague Ian Lewis from Wallasey for sending me the cutting, though what Ian is doing reading the New Statesman is yet to be established. He will be going vegetarian, next. Town and Parish Councils play an important role, in many ways their freedom to freely raise and spend Council Tax allows them greater opportunity to deliver local services and improvements than many district and county councils, who have statutory obligations and spending constraints. Across West Kent we have 200+ parish councils, the overwhelming majority are totally non-party political (rightfully so) though a few of our larger town councils are still contested on party lines. 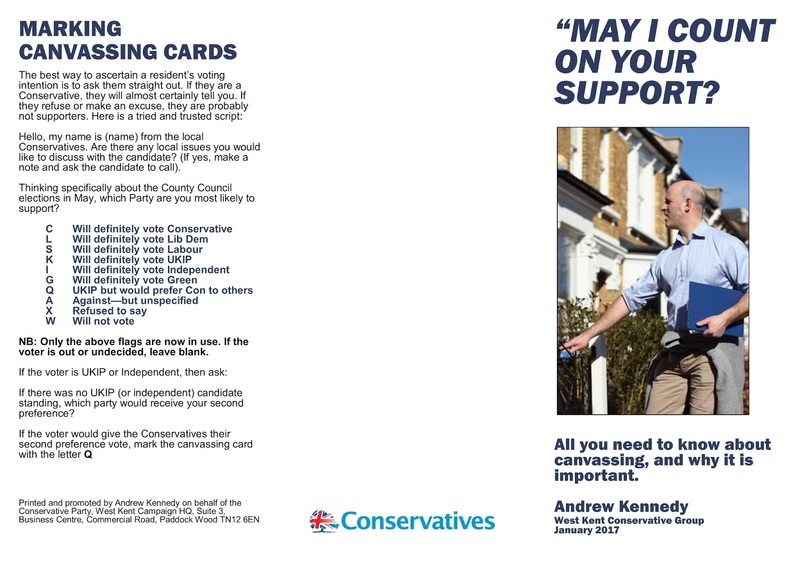 As a rule, apart from printing canvassing cards and giving advice and guidance, the West Kent Campaign HQ does not get involved in third tier campaigns. However today, we had two such by-elections, one in Snodland (yes, there is a very proud and historical paper and quarrying town in Kent named Snodland - it is in Tracey Crouch's constituency) and the other in Faversham. 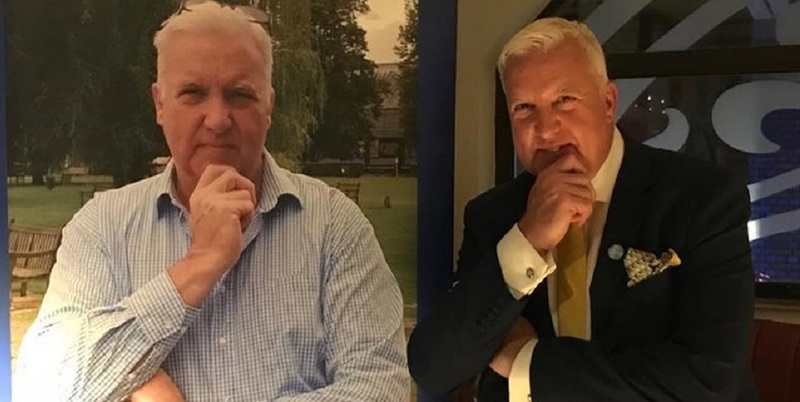 The Snodland by-election was caused by the death of my former friend and colleague Anne Moloney (though we argued every day for the 14 years we knew each other). Anne was the former constituency agent (my predecessor) and it was her total dedication to her hometown of Snodland which transformed the Conservative Party's image and turned a solid red Labour fortress into a Conservative seat with 5/5 Conservative Borough Councillors and 12/14 Conservative Town Councillors. The by-election (and the £5,000+ cost to town council funds) was caused by local LibDem activist who mustered all the style and grace at his disposal and delivered the letters calling the by-election at the exact hour we all gathered at Snodland Parish Church for Anne's Memorial Service. What a charmer. Well, the result is just in...and it's a Conservative Hold. I can claim none of the credit for this result and would not try to do so; that belongs solely to our fabulous branch organiser, David Lettington, and to our candidate James Minter, and our great team of local activists. They worked their socks off and deserved this win. I am delighted; all their hard work paid off and they retained Anne's seat. She too would be proud. Well done and thank you. May I count on your support...? 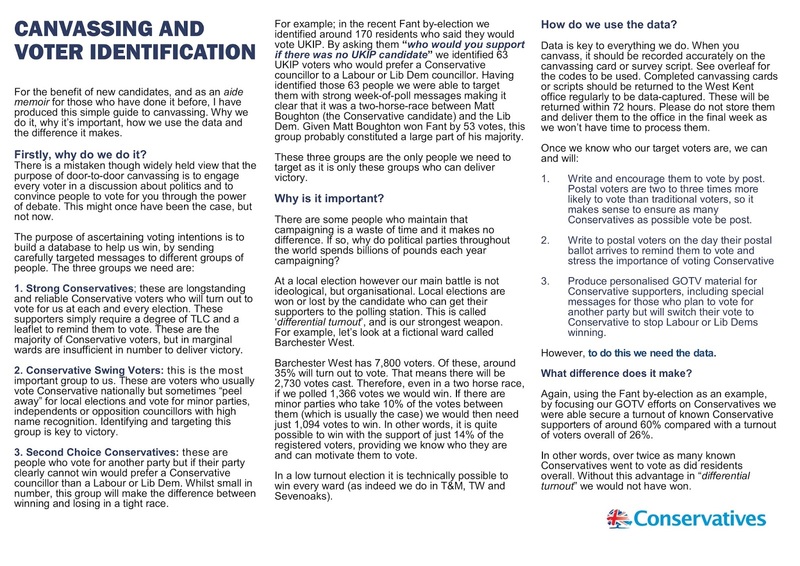 On postal surveys and where our local activists have the skills and time, we always use the 0-10 scale canvassing script. Propensity to Vote (PTV) is clearly the way forward, allowing us to not only identify firm pledges, but also those who are likely to swing to other parties, and most importantly those who might come to us if properly targeted. Unfortunately, many of our more traditional volunteers struggle with the new script, and in some circumstances an old fashioned "which party are you most likely to support...?" is the best way to go, it is certainly better than no data at all. To try and ensure consistency I have produced this canvassing guide for all our candidates, organisers and volunteers. This not only explains the real purpose of Doorstep VI, but also gives real examples of why it is necessary and the difference it can make. We have also abolished the P code (one man's probable is another man's possible) which has always been the bane of my life. Everyone has a different definition of "probable / possible" and unless we understand the psychology of every canvasser, "Ps" are useless.For example, in our December by-election I noticed one hard working canvasser marked down approximately 30% of his houses as P. Should we target these people for GOTV or not? I revisited them personally and spoke to about 20, of which only one or two were ever going to vote Conservative. 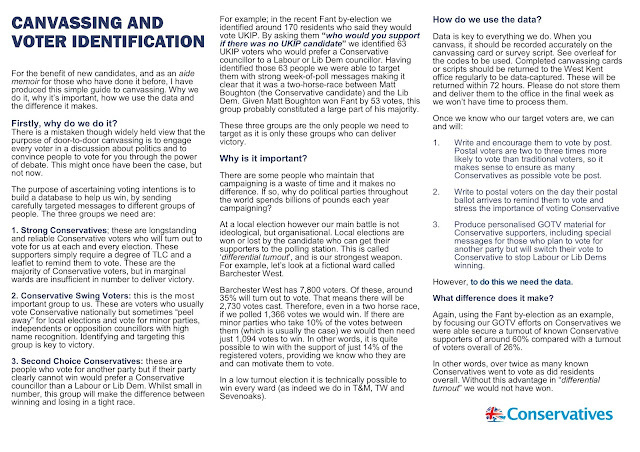 We now tell canvassers that P must not be used, unless you can secure a solid VI, leave it blank and we can visit again. 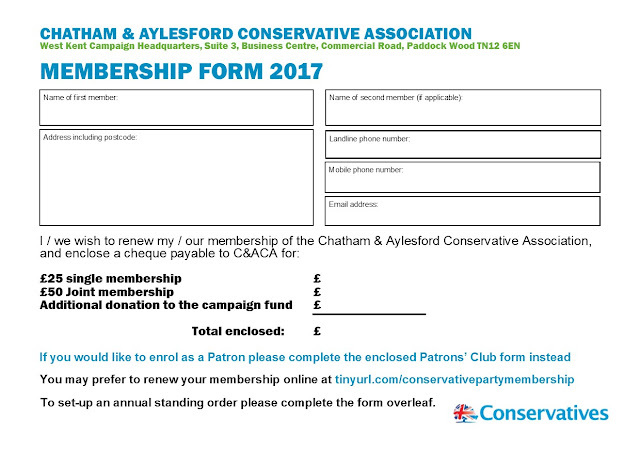 We are also very keen to push the Q code (UKIP voters who would support Conservatives as a second choice). With UKIP now in decline and with a new leader focusing on northern Labour voters, there is now no reason why those former Conservatives should not come back home. This year we are having a major push to enroll new Patrons, encouraging our members to "trade up" their standard membership to Patrons' Club level. Our Patrons' Club offers great value (a couple pay £350 pa or £175 each, which includes a Champagne Garden Party and a three course meal at the Carlton Club or similar, each event with a first rate guest speaker). 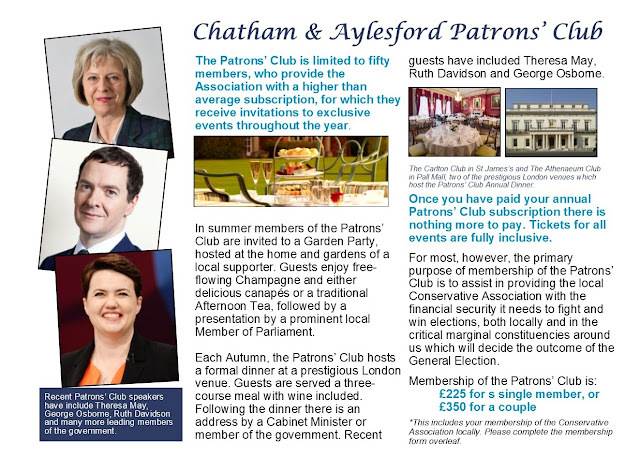 By building up our Patrons and our 500+ Club, we hope to negate any lost income from centrally collected membership and the corresponding increase from £5 to £10 in the fee paid to CCHQ. We have just received a call from a consultant working for one of the UKs leading Public Affairs companies. He pompously informed me that his firm had been retained by a leading Housing Association and he needed details of Kent Members of Parliament. 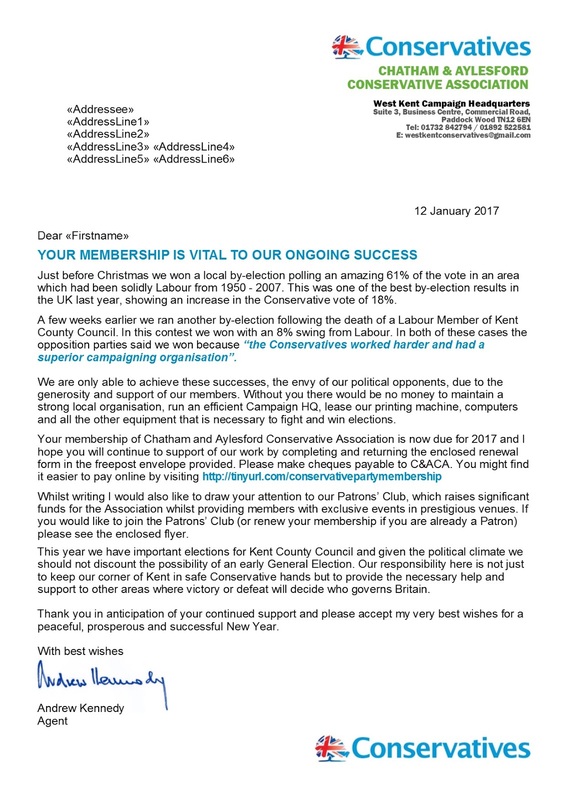 He wanted me to send him "a spreadsheet of all Kent MPs, their constituencies, office address, email, phone number and the name of "the most efficient person in their office who will do something, not just hit the delete button." I told him that the information he needed could be easily obtained online by visiting each MPs website. "Mostly, yes. But it would take me quite some time visiting each one and populating a spreadsheet. It would be much simpler if you could just email it to me." Why he thought I would use paid time and Conservative Party time to assist a commercial organisation did not seem to have entered his thoughts or trouble his conscience. I told him that I would be happy to provide the information he wanted, all of which is in the public domain, but that I would invoice him for three hours of our time at our standard rate when we work as consultants. This did not please him at all. "What, you expect me to pay you for it...?" "Yes", I replied, "just like you charge your clients when they ask you to do work for them!" He seemed somewhat affronted by the fact I was not willing to jump at his command and told me I was "unhelpful". In turn I told him that he had a "bloody cheek" and that I considered his ilk part of the reason Public affairs has such a bad public image. The published Feldman Review was much more radical in scope and bold in aspiration than many of us imagined. Unfortunately, as with any bold reform, we have allowed vested interest to, at best, dilute the package or at worst allow sufficient caveats to ensure those Associations who are most in need of reform to opt-out without any sanction or control. In a few months time it will be two years since our 2015 GE victory. This year we have elections for county councils and city mayors. We have a major boundary review - the most significant in living memory - the fallout from which will occupy minds and attention for years to come. We will then have all-out district elections and a year later another parliamentary campaign, if it does not come sooner. All of this will be played-out against the mood music of Brexit and the uncertainties that will bring. Those who seek reasons to block reform or “put it off until another day” have all the excuses they need. I believe that the Party Board and Sir Patrick McLoughlin are committed to reform and will endeavour to implement change. I wish them well. My fear is they have allowed too much time to pass and too much fiddling at the edges – and now the urgency has gone. The post-referendum surge has contributed to this, too – providing a false sense of security that all is well. In July last year I published detailed research into the attitudes and motivations of our new members, based on 250 responses from the 500 new members who enrolled locally; a statistically significant sample. Of these, 76% said the opportunity to vote in the leadership election was a major factor in their decision to join, and over 25% said that they would not have joined had they known that they would not have had a vote. It is therefore highly likely that a least 25% (probably significantly more) will not renew this year. My view is the fall-out rate could be over 50%. There is also some evidence (in Kent at least) that a small but not insignificant number of committed Europeans will quietly let their membership lapse and similarly, a number of those who were attracted by the Cameron project may also fall away. These three factors, taken with the sad effects of an ageing core membership and the inability of many Associations to collect subscriptions efficiently, might well result in us ending 2017 in a similar or even weaker position than we were pre-election in 2015. I hope to be proved wrong. Having spent years speaking to Association, County and Regional Meetings about the cost-savings and benefits of grouping, just what had we achieved? If our efforts were just improvements to administration, have we really achieved anything at all? Fortunately the glowering presence of a former coal miner and Chief Whip, menacingly clutching his “Coffee Mug that works for everyone” did wonders to focus the mind. There is probably much more that I have forgotten. And we have done this whilst meeting our campaigning, fundraising and administrative obligations to our own five member Associations – at a lower average cost than they were paying previously. And what’s more, for the third year running, we have reduced our running costs (rent, rates, utilities, equipment etc) as we use our numerical strength and buying power to drive down costs from suppliers. What I was unable to tell Sir Patrick (as it was still in negotiation) is our group of five is soon to become six, with a seventh Association in discussions too. Nothing succeeds like success, and I am delighted that we have not only managed to avoid the internal rancour which has broken-up many similar groups, but that others are knocking at the door to share in what we have achieved. Wherever I go to speak about grouping I am warmly welcomed and enthusiastically received. I genuinely believe that the overwhelming majority of members, particularly those who are most politically active, can see the advantages of sharing resources whilst maintaining the independence of their local organisation, but the obstacles and objections thrown up by the vested interests and backwoodsmen halt progress before it can happen. I also suspect that the Party nationally does not have the constitutional authority to impose change on failing Associations. So stalemate ensues and little changes. Time really is running out; change won’t happen unless those who want it to happen are in a place to drive it forward. With your Association AGMs on the horizon it is time to stop moaning from the side-lines and instead put yourself in a position to effect the change you want to see. Last year we received a visit from the police advising us on how we could improve our internal security. This included a strong recommendation tyhat we always close and lock the internal door leading to the communal landing. Gill: "Have you remembered to close and lock the door...?" Gill: "Apparently it is to keep us safe from ISIS!" Glynis: "Oh really? They must be hard-up for targets if they are interested in Andrew and Jon." If any of my blog readers would like to attend, please click HERE to book tickets.